White wine spritzer sloshed in Gabriella’s glass as she spoke, her half-captive audience of fellow preschool moms fidgeted uncomfortably. “I just never know which one to choose,” Gabriella repeated. “I use the same ones every year,” Jennifer said. 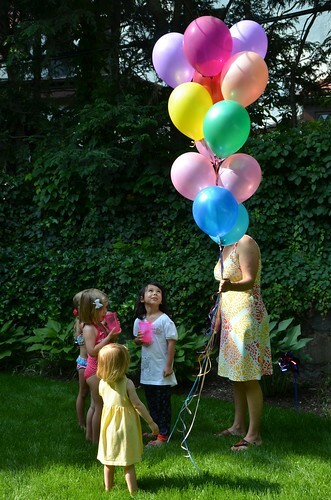 She knew how crazy parents could be about the details of their children’s parties, but Gabriella had been talking about balloons of all things for twenty minutes. “You would like to think so,” Gabriella said, her intensity further unnerving her acquaintances. “Every year I think I find something good, only there’s something wrong with them in the end.” She stared with distant longing at the bouncing child in the pointed hat. “I can’t settle when it comes to poor little Josh. It’s not just that I have to find the right one, he needs to love—“ a pause. “—Whatever I choose as well.” She took another sip; the group used the opportunity to disband.